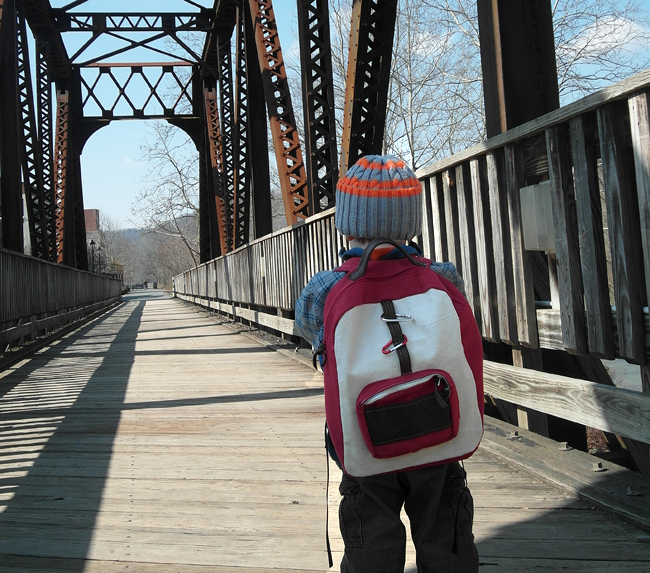 ' Toddler Backpack - Sisters, What! Every time the small one and I go anywhere, we seem to go through this routine where he tries to throw as many of his cars and trains into my purse as possible. Sometimes he tries to get a few of his books in there too. I then try to sneak out as many as possible without him looking. Basically, I decided that he was getting big enough to start carrying his own weight. 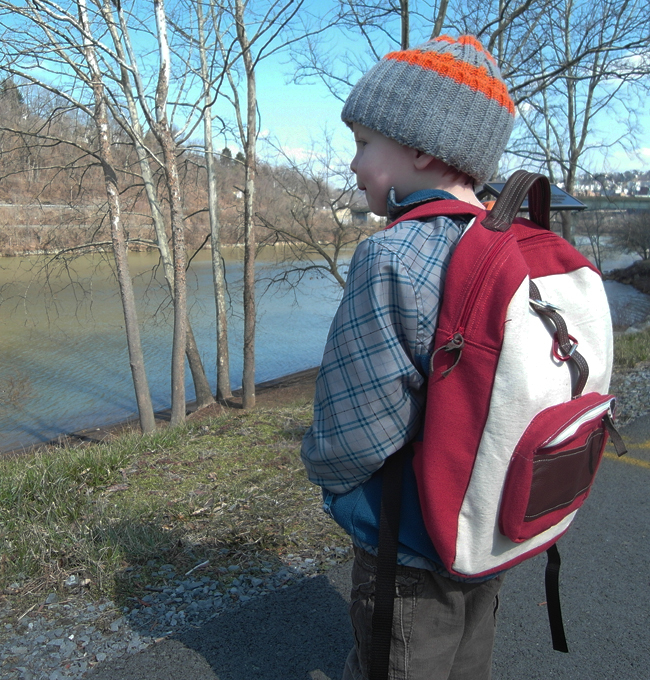 A backpack is what he needed and I was crazy enough to entertain the idea of making one for him. After doing some research, I realized that it might not be so hard as I thought. 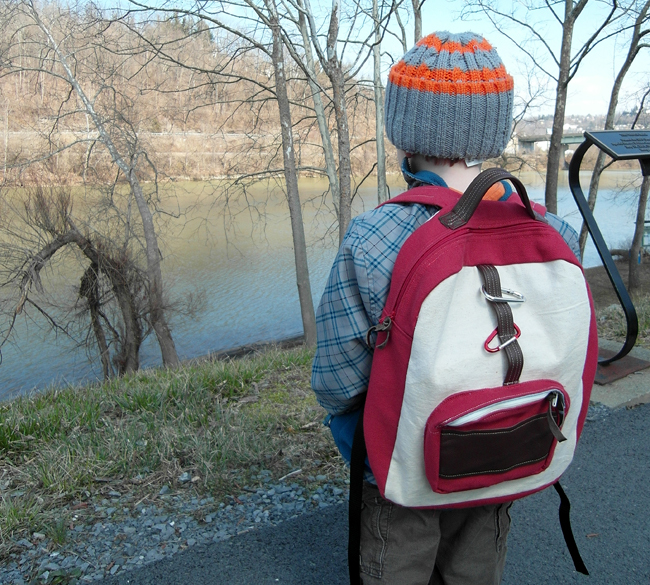 I came across the blog uniquety who had a tutorial on how to pattern your own back pack and then how to assemble it. I decided to give it a shot. I did worry that it would take way too long (and turn out horrible) and that the little one wouldn't like it - but I figured it'd be worth the risk. I took extra care and tried my best not to be my usual lazy self. Which meant, I had to unpick many seams until I got it right. 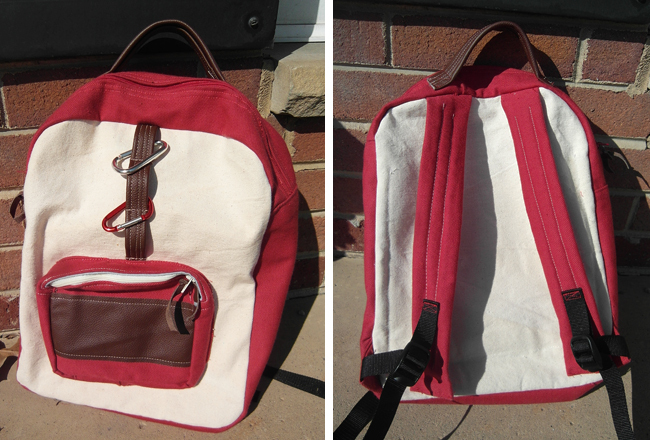 The backpack turned out GREAT!! I was happy and even the hubs (who loves backpacks like women love shoes) thought it turned out awesome. The best part - Luke LOVES it!! He insists on taking it everywhere we go. This is probably the most loved and useful thing I've ever sewn. For my fabric, I had some left over duck cloth and red tapestry, and they worked perfect together. 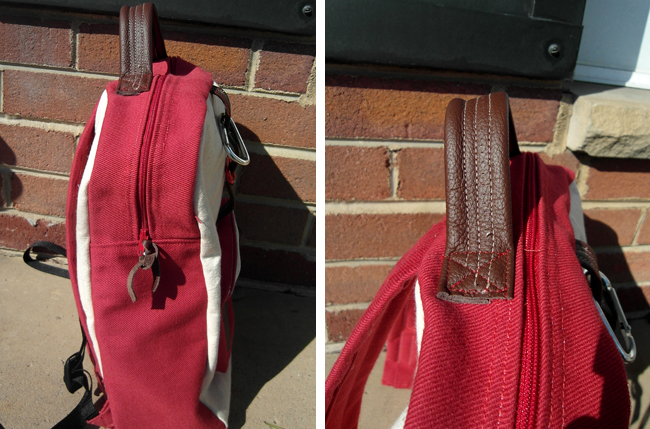 I even had some scraps of real leather that I added as accents. The leather details are probably my favorite part. 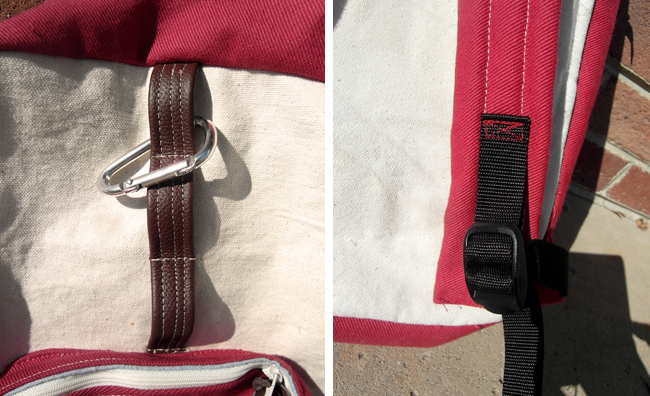 (below): I even added a daisy chain (to clip carabiners to) for fun. Luke of course is too young to understand how cool it is, but one day he'll get it and think it's totally awesome. I haven't done this part yet, but I think we're going to add a chest strap for extra stability (hubs suggestion of course). For the tutorial at Uniquety blog go HERE. I'm so happy with how it turned out, but ecstatic that the little one loves it so much. I highly recommend making a backpack to everyone. It wasn't as hard as I imagined it was going to be. Cheers! wow. you're basically a pro now, aren't you. Couldn't tell you didn't just buy it from some high-end toddler boutique. Props. I just can't believe you got Luke to stand so still for those photos! Backpack looks great. You are amazing. LOVE IT!!! It looks great!!! Oh my, I love this so much! It's perfect. havalah, you ROCK. seriously awesome backpack. i can't believe how big Luke is! and I heard a rumor (from Kristin M) that you just might be moving to Portland?! 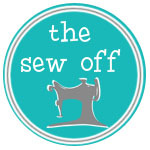 I would love because then you could help me make all these cool sewing projects!